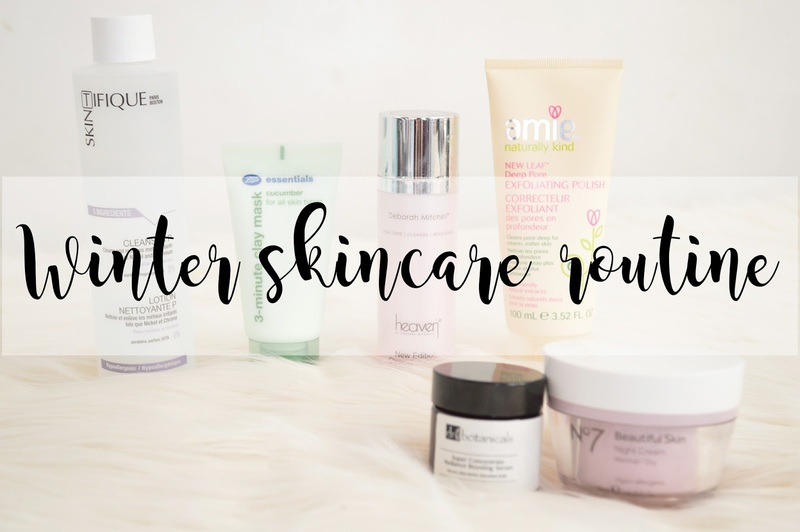 So it is day thirteen of Blogmas and today I am sharing with you my Winter Skincare Routine which I do nearly every single evening (apart from the face mask). I never used to have a skincare routine, I used to simply use a baby wipe to remove all of my makeup and then I'd moisturise using whatever moisturiser I was using at the time. However, I have been using this skincare routine for the evening for around 3 months now and I have been really enjoying it. I started off using one product and eventually I've brought in more and more products just to make sure my skin doesn't have a reaction to any of them. I'm happy with the way my skin has been feeling and also looking recently. I still have break outs but that's completely normal as a girl, I only ever have them when I've just had my period so it's not a big issue! First things first, I take off my makeup using a Micellar water; I have so so many however my go to at the moment is Skin Tifique Cleanser. I absolutely love using this as it doesn't have a scent. I recently tried out a micellar water which had some sort of fragrance too it which my skin really did not like and it's not the best product to use to take off makeup from your eyes whereas I do not have this problem with this Micellar Water or Garnier's (by other go to). Not only does this Micellar Water leave my skin feeling silky soft, but it also removes all of my makeup very easily and very quickly. A couple of times a week I use the Boots 3 Minute Cucumber Clay Mask . This was the first face mask I ever used and it was a very weird feeling at first if you have never used a face mask before. To begin with I really did not like how dry it felt on my face just before I washed it off with a hot flannel but it's a feeling I have got used too. What I love about this face mask is how refreshing it leaves my face feeling because of the Cucumber which is in it. It's not too thick but it's not too runny either and it's easy to apply due to it's smooth texture! After using a face mask I then use the Heaven Skincare New Edition Cleansing Cream (I recently featured this in my favourites). I use this after my face mask just to ensure I have removed all of the face mask from my pores etc and also to ensure all of my makeup has been removed. This has a scent too it however it's not too strong and it's quite a fresh scent as well. I love how this feels when I apply it and it's one of those products which also leaves you face feeling extremely soft and almost moisturised too. Although the Amie New Leaf Deep Pore Exfoliating Polish clearly states only use once or twice a week, I use this every single day. I have found if I use this every day, not only do my blemishes clear up within a day or two, but my skin generally looks incredible compared to when I do not use it! I love how it smells like birthday cake almost, it's such a sweet vanilla scent, I absolutely love it. It's a product which I cannot go a day without using now, which definitely says something! Before applying my night cream I like to use the Dr Botanicals Radiance Boosting Serum first. This product aims to "boost skin radiance while soothing, moisturising and deeply nourishing skin". I use this at night as it's supposed to improve radiance overnight to have beautifully glowing skin in the morning. This product feels incredible on my skin as it's such a cooling product. You definitely do not need a lot of this! Less than a pea size I'd say. Last but not least I use No 7's Beautiful Skin Range for Normal to Dry Skin. I have been using this for a year now and I have been loving it ever since the day I tried it. I also use the day cream and I haven't had any issues with my skin being too oily afterwards, or even too dry. It's the perfect moisturiser for me. When using this my skin feels so hydrated, it's a product I always need after removing my makeup otherwise my skin is left feeling dry and tight. If you haven't tried out No 7's skin range, I definitely recommend it as they have such a variety of skin care products.